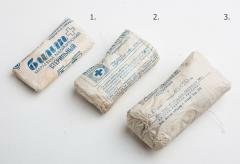 Old Soviet army bandages, extremely simple paper wrapped type. Three different types available. Pro-Tip: Also works as camo material for weapons and gear, just wrap and tie generously and spray it with your favourite colours. 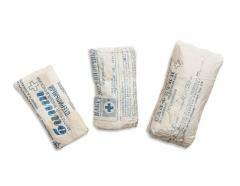 These are naturally unused, but since these are about 30-40 years old we can't sell these for any actual first aid use. 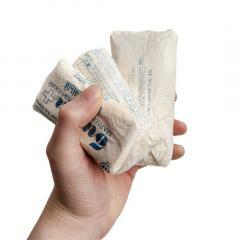 Great for training though! Siteilyyn ja hifistelyyn. HUOM! HOMEESSA. Kyllä tällä on yks sormi sidottu, josta verta tuli aika paljonki. Potilas elää edelleen.